Once you’ve finished your work on an existing investment property in Honolulu and are getting ready to retire your private loan, you’ll either keep the property or sell it. If you keep the property for a long term hold and monthly cash flow, your best option is to obtain a conventional loan. If the loan amount is at or below the conforming loan limit for your area you’ll probably end up with a fixed rate loan ranging in term from 10 to 30 years. The longer the term, the lower the monthly payment, which in turn boosts cash flow. Conforming conventional loans are by far the most common which result in lower interest rates and more lenders compete for your business. If you don’t intend to keep the property and you’re going to flip it, your future Honolulu buyer will most likely do the same and select a conventional loan. Real estate investors who regularly add to their portfolio keep a keen eye on financing costs and with today’s long term interest rates still at relative lows a fixed rate loan will be the choice. Fixed rates help investors more easily calculate current and future cash flow. But private loans also lead to better permanent financing. How so? How do private loans impact future financing? Two important things are at play. First, private loans require a larger down payment compared to some other mortgage choices. At CIVIC, our minimum down payments can be anywhere from 20-25% depending upon the transaction while other deals may require a down payment of 30%. Each application is evaluated independently. Second, once a property is 100% rehabilitated the property value will be much higher compared to the initial purchase price you paid for the investment. These are the numbers you, your contractor and your real estate agent have put together to determine whether or not a potential purchase meets your requirements. If the math works out, it’s probably going to be in your portfolio shortly. But once you acquire and make the necessary improvements, the property value will increase both in terms of comparable sales in the area as well as the income it generates. When you consider both of these factors, the initial down payment and generated equity the permanent mortgage that will soon be placed on the property will have a more attractive LTV compared to a straight purchase of an existing property in good shape with a conventional mortgage. Let’s say you’re out to buy an existing property that does not need any repairs. Your loan for a rental property will ask for a down payment of 20%, more if financing a 2-4 unit. This is the minimum down payment and your loan amount will be at 80% of the current value of the property. Interest rates for rental properties can adjust based upon the amount of down payment. For example, a 30-year fixed rate permanent mortgage will have a slightly better interest rate if you put down 25% instead of 20%. 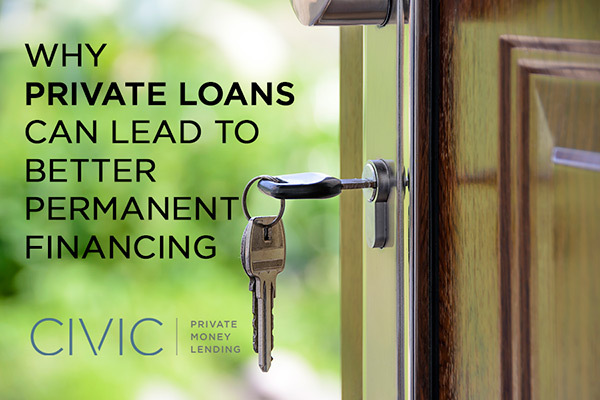 If you first take out a private loan and then refinance the unit after all the work has been completed, because of your initial down payment plus the increased equity, your LTV will be lower which will result in a more competitive interest rate when you take out the permanent mortgage.